When Dr. James Naismith invented basketball in 1891, he could not possibly have foreseen that his pastime would become one of the world’s most popular sports. The YMCA training school in Springfield, Massachusetts, needed a sport for the young men to play indoors during the winter, and so it called upon one of its instructors to create a game that would give the boys some exercise. It was far too cold to play baseball or football outside. Dr. Naismith asked the janitor to nail peach baskets to the wall of the gymnasium. More than a century later, Naismith’s basketball game has evolved into a major global business enterprise. Millions play the game and even more spectate. Top players in the National Basketball Association use their athletic skills to make a fortune and their international fame to reap valuable endorsements. Few, however, do so with the proficiency of LeBron James. 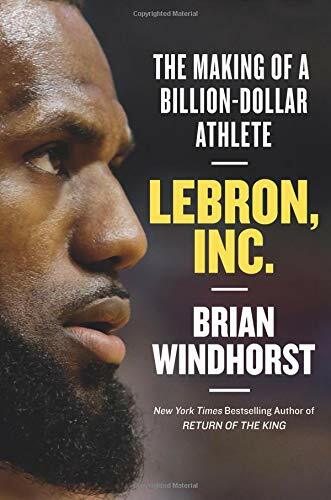 Brian Windhorst’s LeBron Inc.: The Making of a Billion Dollar Athlete explains how a teenage athlete from Akron, Ohio, made himself into a sensational entrepreneur. “Windy” Windhorst is a sports writer for ESPN.com with Akron ties that paralleled Lebron’s. He followed LeBron’s career from his post with the Cleveland Plain Dealer. Many books involving star athletes extol their physical and competitive virtues. This is not the book from which to learn how LeBron became one of basketball’s all-time greats. LeBron’s skills on the court are evident for all to see. However, his work behind the closed doors of Nike, Gatorade, Coke, and Kia are not public knowledge. This is the book that explains, as no one has done before, how the business of basketball, including most importantly the endorsement game, is played. LeBron was fortunate in his choices of friends and business partners. With good agents and talented fellow Akronites, LeBron climbed the ladder to monetary success. The author’s reference to a “billion-dollar athlete” is not hyperbole. It is fact. Not every venture by LeBron was successful. His effort in developing a player agency did not work as well as his personal endorsements. However, LeBron did learn when to drop one project and pick up another. The catastrophe of The Decision, when he announced to the sporting world on live television that he would desert the Cleveland Cavaliers and take his “talents to South Beach,” would take years to live down. LeBron’s destination of South Beach was also in error. The Miami Heat play in downtown Miami, and South Beach lies a few miles east across the Bay on the island of Miami Beach. Everything LeBron touched did not turn to gold, but he has certainly made his way toward a billion-dollar stockpile. After returning to Cleveland and bringing them an NBA championship, LeBron has now ventured westward to rehabilitate the Los Angeles Laker franchise. Only time will tell whether he will bring basketball magic back to the City of Angels. In any case, LeBron will be nearer to the site of his next challenge: “bringing his talents to Hollywood.” Lebron and his company will produce “content”—entertainment and movies. When his playing days are over, LeBron will assuredly buy a sports franchise. His success has just begun, and Windhorst will be there to chronicle his accomplishments.